Officials defend snowstorm approach; Yahoo to spin off share of Alibaba; GoDaddy pulls Super Bowl ad; The fastest-growing Twitter following in the world will surprise you. 1. 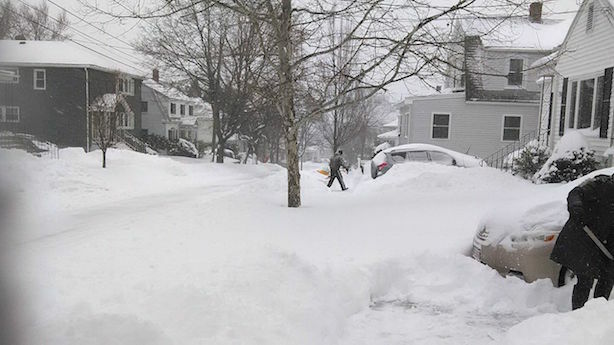 New York and New Jersey officials are defending their build-up of Monday night’s snowstorm — Boston, however, is still digging out — emphasizing a "better safe than sorry" approach. One National Weather Service meteorologist tweeted his apology for the overwrought prediction. Here’s why weathermen got it wrong, according to FiveThirtyEight and BuzzFeed. Meanwhile, after thousands of cancellations, airlines are struggling to get back on schedule. 2. Yahoo said Tuesday that it will spin off its share of Alibaba Group, saving it tax payments and buying Marissa Mayer more time in the company’s top job. (Here’s how the nuts and bolts of the deal will work, according to DealBook). Mayer also dismissed a partnership with AOL in an interview with The Wall Street Journal. Early Wednesday, a Chinese state agency began criticizing Alibaba for using unlicensed merchants and allowing fake goods to be sold on the platform. 3. Former Vermont Governor Howard Dean apologized to veterans on Tuesday for saying there is an "intersection" between people who enjoyed the film American Sniper and angry Tea Party activists. 4. GoDaddy said Tuesday that it will pull a Super Bowl ad it released early that features a cute puppy and a twist ending due to complaints from animal-rights activists that it endorses puppy mills. Social media users pilloried the spot this week. 5. President Obama is dropping his push to end tax breaks associated with "529" college savings plans after he was criticized by both lawmakers and parents. The program is used by 12 million American families. 6. His country isn’t exactly progressive when it comes to the Internet, but new Saudi King Salman has the fastest-growing Twitter following in the world. In the past week, he’s picked up followers at a faster pace than Taylor Swift and President Obama.